We had sold our house with a provision to do renovations after we left. We were making a long distance move. We had started a new company with my son and daughter. We had bought a business. I promised I would set aside my hypnotherapy business as much as possible for a year to dedicate myself to our new business. We had great ideas and enthusiasm for Our New Adventure! Our first “real” day of business there was much excitement. Realistically, we knew there was lots of work ahead, but it was doable. We knew there would be challenges of all sorts. Bravely, we vowed we would work through them. As the three of them went out to work, I took my 3 year old granddaughter and headed to my doctor’s office to renew my prescriptions before our move. Full of glee I promised to buy her a treat at the store afterwards. My doctor opened his computer, looked at the screen and said, “I see you had a mammogram yesterday.” I said, “Yes, they will be sending you the results in 3 to 5 days. “No,” he said, “I will have them faxed over.” He left the room to do so. When we finished what I had come for, he again left the room to see if the results have come in. About 10 minutes later, he returned. He sat down, pulled his chair a little closer, and said, “As a matter of fact, there’s no doubt that it is breast cancer. At the words, “they’re not good”, my heart stopped. At the words, it’s breast cancer, the world turned over. No, that doesn’t happen to me, I thought. No, this can’t be happening. All I could think of was my daughter and my little 3 year old granddaughter who was playing with toys near my chair. What would this mean for their future? There had not been any history of breast cancer in my family. I had breast fed all three of my children. We ate TONS of broccoli. I hadn’t a care in the world about breast cancer. Until then. Stunned I left the office and went straight home. There would not be a trip to the store that day. Already I felt separated from the rest of mankind. In Lethbridge, Alberta, I had a right mastectomy. 11 lymph nodes were removed, it had spread to 2 of them. At the end of July, we moved to Kelowna, B.C. It all was some form of torture. My husband and son had to return to Lethbridge as soon as we were unloaded. I was alone in a house with packing boxes. My daughter got to return to her home after months away, but she was also left with the ongoing burden of taking me to Emergency at the hospital to have fluid drained from my chest. When you move away from your surgeon, especially to a new province, what was a 5 minute procedure, turns out to be an extensive wait at Emergency. One time we waited for over 3 hours. Yes, with the 3 year old. This is what happens after you have such a major surgery and then can't rest and let it heal. All the movement of packing and moving (including driving 10 hours from Lethbridge, A.B. to Kelowna, B.C.) created a constant build-up of fluid. One time more than a litre and a half was removed. Very painful. Then Alyssa got to go to all my Cancer Clinic appointments, and she would sit with me through as much of my chemo sessions as possible. She cleaned, cooked and cheered me up, did my yard work and helped in every way possible. All this while looking after her daughter, her home and working. There was one thing she didn't get to do. And that was her own self care. I expected her to have some kind of break down. But she just kept on going. Kind, cheerful, understanding. Month after month. One day Alyssa and I were driving home to the Westside from Kelowna. The sun was bright, even a little bit blinding. She commented that as it had been cool and cloudy that morning, she had left her sunglasses at home. Now, in a few hours, the day had changed dramatically; we were in a beautiful hot, Okanagan summer day and she needed her sunglasses. Minutes later, we were standing in the family room at my home. Suddenly, the whole atmosphere changed. A huge wind came up out of nowhere, trees were being tossed every which way as the wind howled crazily down the hillside, blowing in a sudden rage around the houses. Leaves rose furiously high into the air, in every mixed up direction. I’d never seen anything like. An old tree in downtown Kelowna was uprooted and blown over. In ten minutes it was over. As suddenly as it started, the trees stopped moving, the leaves fell to the earth, everything became quiet – and that beautiful, Okanagan summer resumed as if nothing had happened. This is breast cancer, I thought. This is exactly what it is like. A whirlwind that comes out of nowhere, that comes quickly, out of the blue and completely changes everything. You’re left gasping for breath, if you can breathe at all. Breast cancer creates and leaves its own form of destruction behind. Breast cancer may feel as if a giant hand has reached into your life, picked everything up and tossed it all into the air. Now, you get to see where it all lands and what your life will look like. Some things are more challenging, some things may become better. You meet some wonderful helping people. People who have been diagnosed with breast cancer; people who are highly trained in the breast cancer field; volunteers who give of their time to make life a little easier for you. These are people who know breast cancer. You will be overwhelmed at times. You cannot do this breast cancer journey alone. You will need a buddy to go to appointments. A close or a new relationship may become even closer. Some people will be kind; you will be amazed at such generosity of time and spirit. Some people will be cruel. One woman said to me, “Your friends will desert you.” Breast cancer patients often talk about the look they see on the faces of people when they learn they have cancer. They feel hurt and isolated when they sense a withdrawing. Many friends and even loved ones disappear. Even in the midst of love, you may feel isolated and alone. After all, this is your journey; others may walk beside you but you walk on the path. During your journey with breast cancer, your emotions take a trip of their own. Copious tears will soak your pillow at unexpected times. Like the whirlwind, emotions can be a flurry that whips up in an otherwise calm, sweet moment. Sometimes you dread being with others because you never know what you’ll do or what they’ll say. Best intentions may go astray and hurt terribly. There is anger. Your own anger and the anger of others will flash up in a storm. It will hurt. People will generously offer their assistance only to turn a deaf ear when you accept it. You will need help. Shopping may be very tiring and difficult but you need nutritious food, good water and even getting out of your home to see that the world outside of the cancer clinic or a doctor’s office does still exist is important. Once you’ve had surgery or treatment for your breast cancer you will need help with heavier housework. You’ll be amazed at how heavy a pot can be and how high or low a shelf has become. A vacuum cleaner that you never paid much attention to before is now a heavy cumbersome weight. This is a time to say “I need help” to family, friends, fellow church members, and co-workers. Accept it graciously. Ignore the help that never shows up. Rise above the unkindness and neglect of those who should have and could have helped you. They have their own problems. Hard as it is, this is a time for you to let it go. You need loving kindness around you. Gentleness that understands your many mood swings. You need a healing peacefulness. Create it as much as you can. When I was diagnosed, I created a sanctuary in my room. I bought apple-green sheets with a matching cotton blanket. Green is a healing colour. I arranged a bouquet of white silk tulips and set them in a vase in a corner of my bedroom where I could see it easily. I put pictures of my family nearby. I set up a small CD player in my room close to my bed and put a stack of healing music beside it. Music can bring such peace and calm into your heart and mind - and there are such incredible selections of CDs. I mostly played a CD my son and daughter-in-law gave me. It acted as an anchor to my inner sanctuary (in part because it had been a gift from them) and held me for many months. I remembered a website I had been to when I was first studying hypnosis. I went there immediately and copied all the affirmations which I recorded, along with some prayerful thoughts of my own. I recorded many hypnotherapy tapes and had them with a tape deck next to my bed. When I would suddenly become overwhelmed I would quickly go to my room, put the headphones on and disappear into a safe place. When the whole world seems out of your control, self- hypnosis gives you time and skills that help you to focus and renew yourself. It reminds you that you are in control, or can be, of your thoughts and gives you the ability to regain that control when needed. For some people they find instance relief with the first session they listen to; others find solace only after listening many times. Having had lots of practise and personal use in the years before my diagnosis, I mostly found the recordings (my own or others) to calm me quickly and effectively. They became a much appreciated crutch at the depths of my emotion and a welcome tool that helped me deal with pain or fear. The only time I had trouble was dealing with my impending chemotherapy. Most women worry about losing their hair – I could cope with that! It wasn’t so bad. But the thought of chemotherapy absolutely had me terrified to the point of hyperventilating. 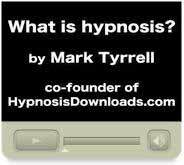 Even a few years ago, there weren’t that many options for hypnosis recordings but I did access one (I could find no hypnosis scripts and, at that point in time, was beyond creating one myself! Oh, gosh. But I found this recording by someone else. I knew it was out there and asked at the Cancer Clinic in Kelowna. At first, I was told they didn’t have a copy, but, (driven I’m sure by panic!) I persisted and was able to take a recording home for free. I went home knowing that my “panic” would soon be gone and I would be calm and confident about the chemotherapy long before I began my treatments. To my surprise, that wasn’t the case. I listened every day a few times. Every day the dreadful fear still clung to me. The days went by, my first treatment was drawing closer. Finally the night before my first treatment I felt peace in my heart. That’s the longest any hypnosis session has taken to give effect for me. That was almost 2 weeks. I’d never even had a hypnosis client have that trouble. If you’re thinking that it was the fault of the recording, it wasn’t. It was me. My fear. Hypnosis, and self-recorded hypnosis, visualization, positive affirmations, prayer and meditation are some of the best resources you can gather about you to help you survive the journey you are on with Breast Cancer. They were useful tools that helped me to release many fears, gain some control over pain, and allowed me to open up my heart, mind and spirit to... well, words fail me here. This journey we are on brings with it fleeting openings in the veil that separates us from Heaven. Anything, you’ve probably already noticed, in life that brings us to our knees also comes with blessings of spiritual experiences. How hard to describe! But, sometimes, in those moments of our deepest despair, a vision, a voice, a thought floods into our being - and suddenly it all seems so worthwhile, so valuable to have those feelings in our heart, that we would not change what has happened for anything. It is all worthwhile for this moment. It is my prayer that you, too, will feel Heaven’s Love touch you also. That you will feel comfort. This isn't the end of my story. There is more to come and I would also like to share with your Breast Cancer Prayer at 4 PM. Breast Cancer at 4 PM is just a "small and simple" way we can help others and share our stories. Those pages will be up in a day or two, so please check back for more on this story. I'd really like you to be on this journey with me and others. Here are two downloads that might help you, too.